Thanks to Dr. Carlos Montenegro, Centro Hospitalar Barreiro Montijo (Portugal) for contributing this case. To contribute a Case of the Week, follow the guidelines on our main Case of the Week page. To advance the understanding of disease mechanisms in cancer, it's critical that you see everything the tumor has to show you. With our Phenoptics research solution, you can visualize and measure tumor cells and multiple immune-cell phenotypes simultaneously in FFPE tissue. Phenoptics integrates multiplexed immunohistochemistry and imaging to quantitatively capture systems biology data with cellular detail. It reveals multi-parameter cellular expressions and interactions while retaining spatial context, offering insights into the complexity of immune-cancer interactions. Learn how industry leaders are advancing their cancer research with our award winning Phenoptics Research Solution for Cancer Immunology and Immunotherapy by downloading our e-book now. (1) Dr. Pernick is interested in meeting pathologists to discuss their ideas about improving the website. He will be in Miami Beach, Florida on December 1-4, 2016, and in Havana, Cuba on January 14, 2017. If you are interested in meeting, please contact him at NatPernick@gmail.com. (2) Per a visitor suggestion, we have started adding test questions to the Case of the Week. Let us know what you think. (3) For October 2016, we set three new records: 16,671 sessions (visits) per day, 516,794 total sessions (visits) and 1,352,535 page views. We also had a record 60 new job postings. 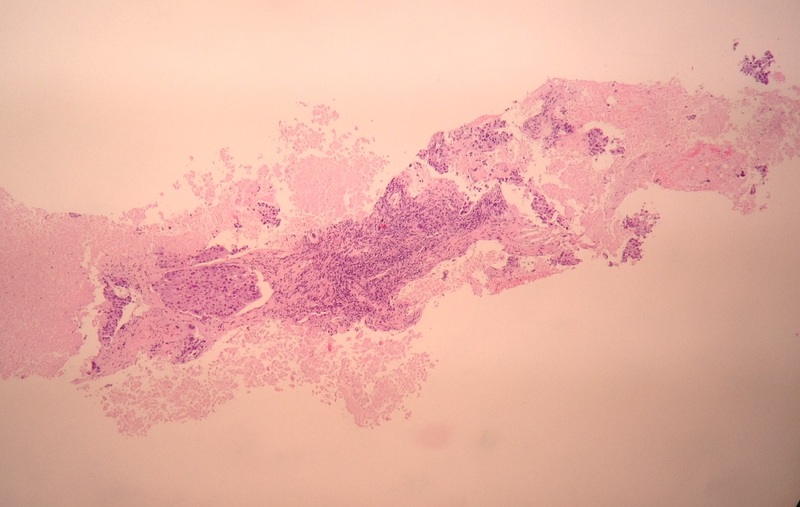 A 56 year old retired fisherman presented with upper GI bleeding. He was a heavy smoker and alcoholic, with a past medical history of emphysema, and a family history of uterine cancer (mother), breast cancer (sister) and hepatocellular carcinoma (grandfather). His hemoglobin was 6.9 g/dL and C reactive protein was 191.6 mg/L. 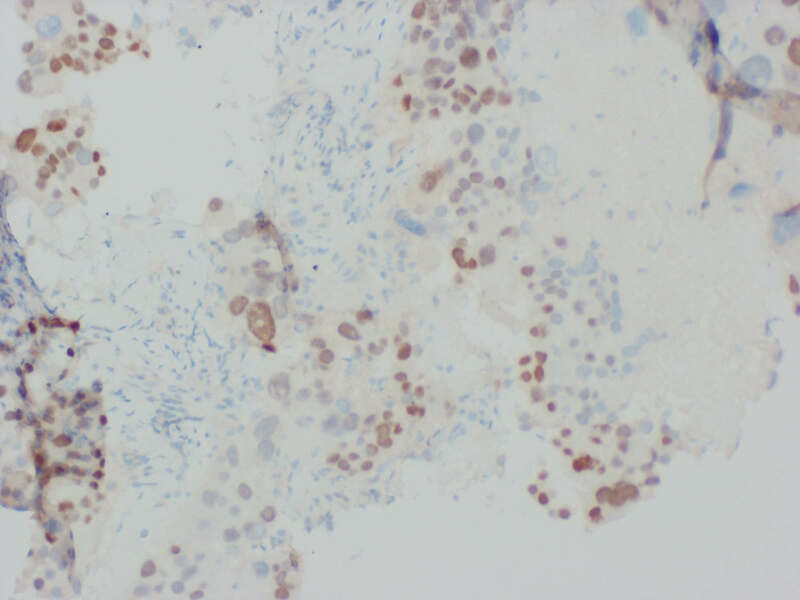 Gastric biopsy was performed (below), but IHC could not be done due to limited material. Tumor markers were CA19.9 of 7.9 U/mL (normal: <37 U/mL); CEA of 1.4 ng/mL (normal: <2.5 ng/mL); CYFRA21.1 of 88.7 ng/mL (normal: 0.25 - 3.3 ng/mL) and NSE of 23.6 ng/mL (normal: <12.5 ng/mL). CT of the chest and abdomen showed a right lung apex multinodular lesion, 9 cm x 6 cm; hepatomegaly with a heterogeneous multinodular lesion, probably representing metastasis; pancreatic structural change, with a suspicious hypodense lesion in the pancreatic body; and retrogastric and para-aortic adenopathy. No testicular lesions were present. 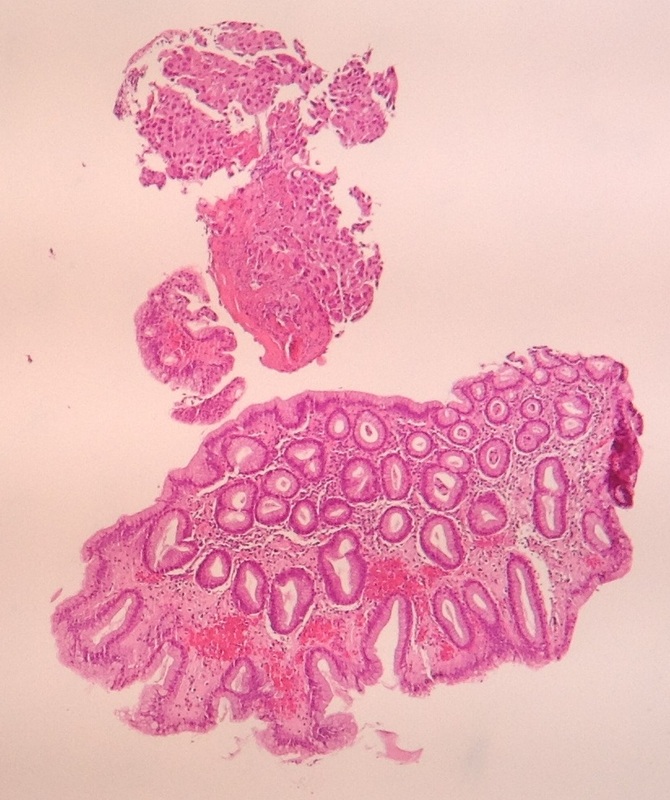 Stomach, liver and lung biopsies are shown below. 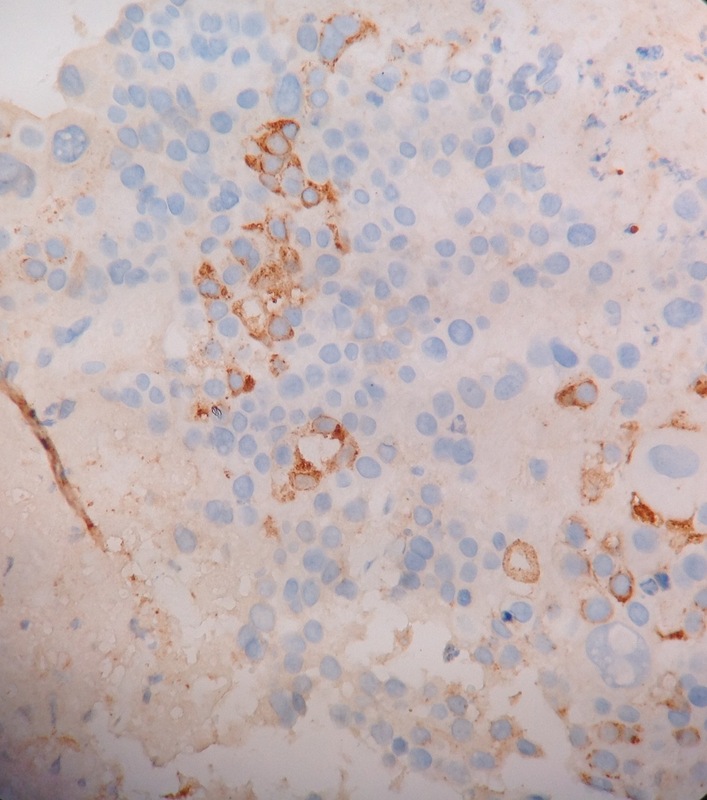 Additional immunostains were negative: polyclonal CEA, HepPar, CD56, synaptophysin and S100. 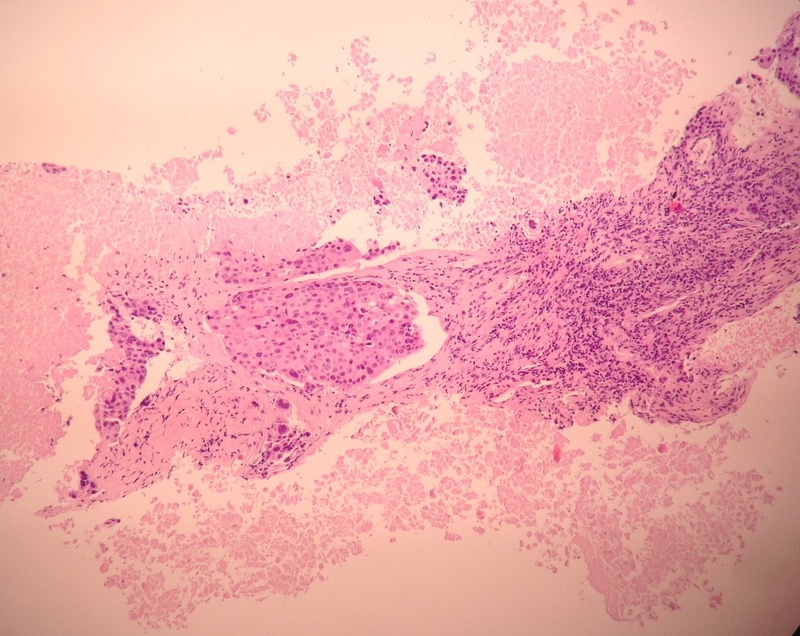 Choriocarcinoma is a malignant trophoblastic tumor composed of an admixture of syncytiotrophoblasts and cytotrophoblasts with marked cytologic atypia. 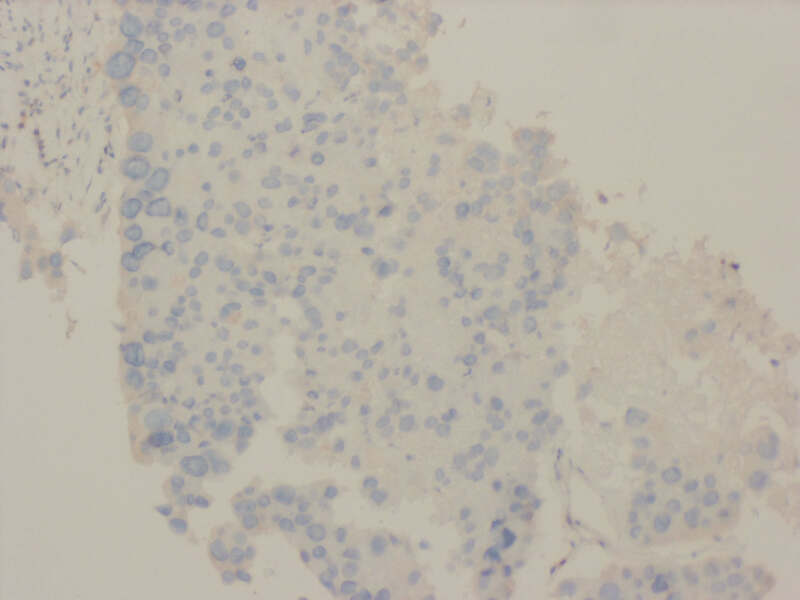 Intermediate trophoblasts may also be present. 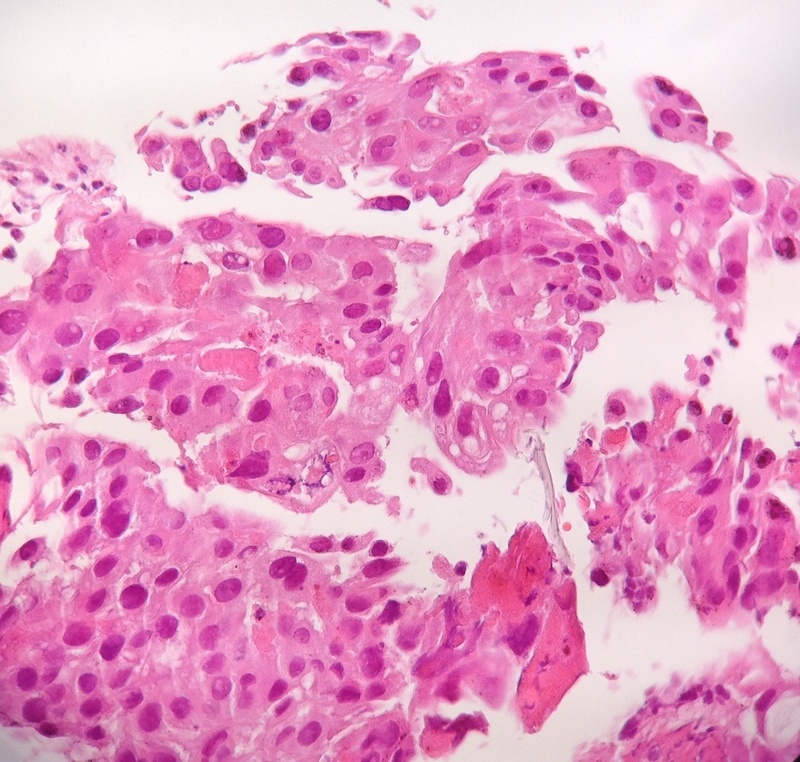 Syncytiotrophoblasts are large, multinucleated cells that frequently have cytoplasmic vacuoles. Cytotrophoblasts are small, polygonal in shape, and have a single nucleus and amphophilic or clear cytoplasm. 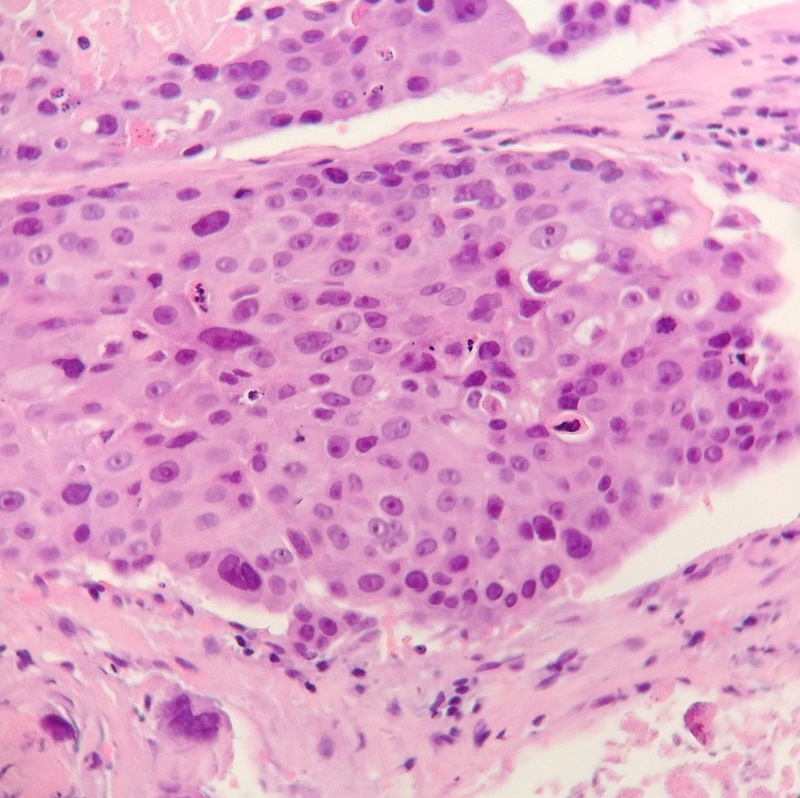 Intermediate trophoblasts are polyhedral to spindled, larger than a cytotrophoblast, with eosinophilic cytoplasm and one to multiple reactive appearing nuclei that often have intranuclear inclusions. Vascular invasion and extensive hemorrhage and necrosis are common. 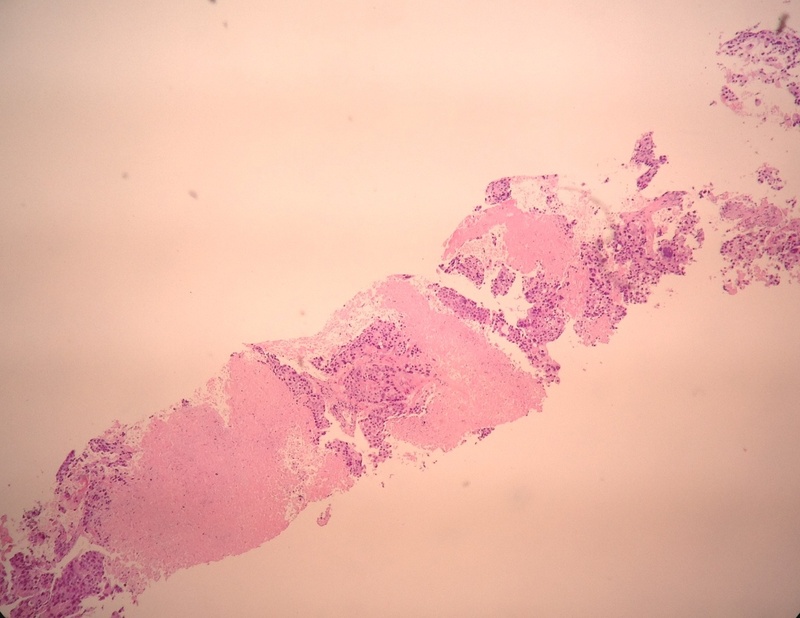 Viable cells may be present only at the periphery of the hemorrhagic areas. Villi are not present. 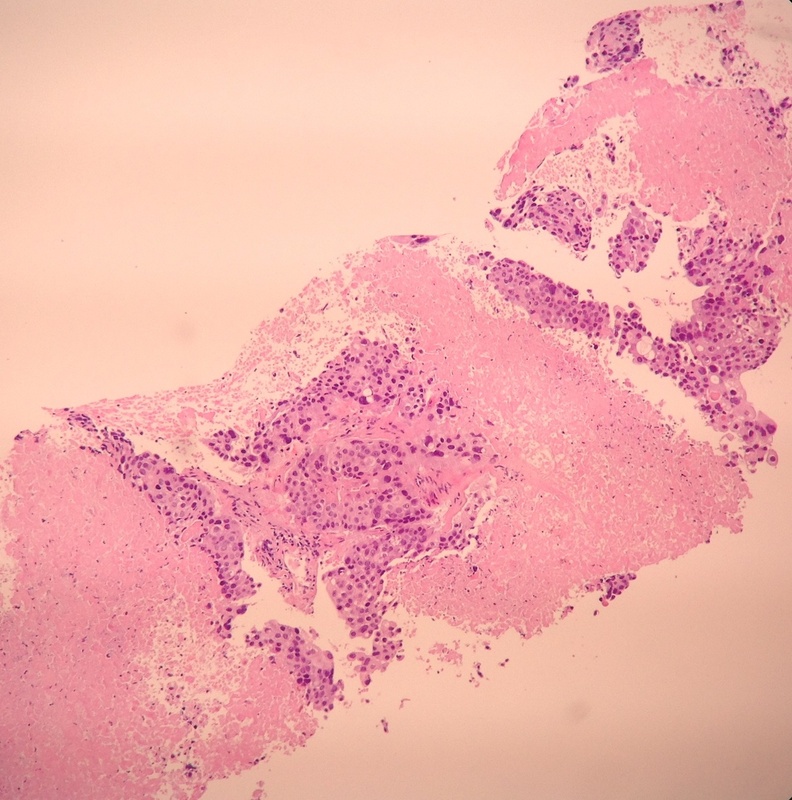 Choriocarcinoma is aggressive, most commonly metastasizing to the lung; however metastatic disease can be present in unusual places including gingiva and eye (Wick: Silverberg's Principles and Practice of Surgical Pathology and Cytopathology, 5th ed, 2015). 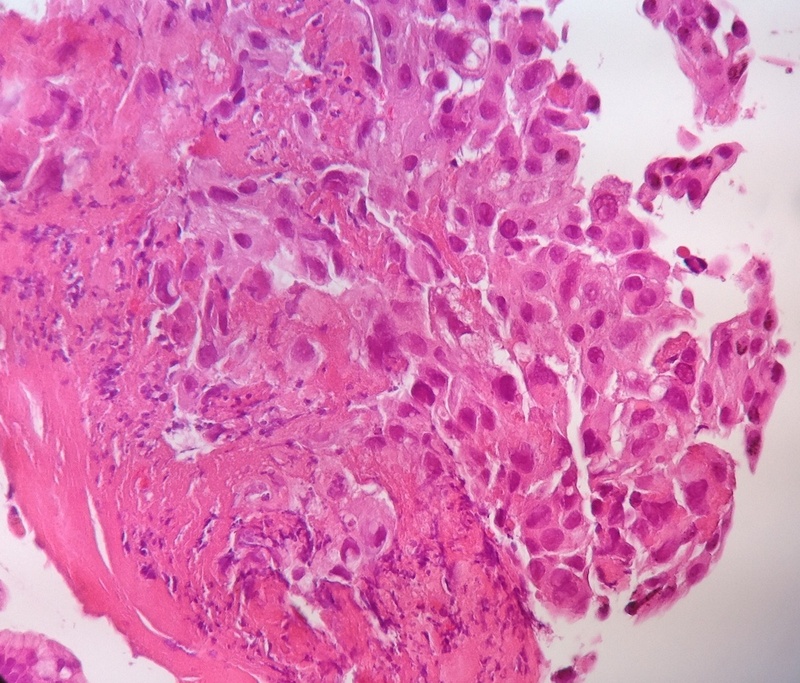 Choriocarcinoma is divided into gestational and non-gestational types. 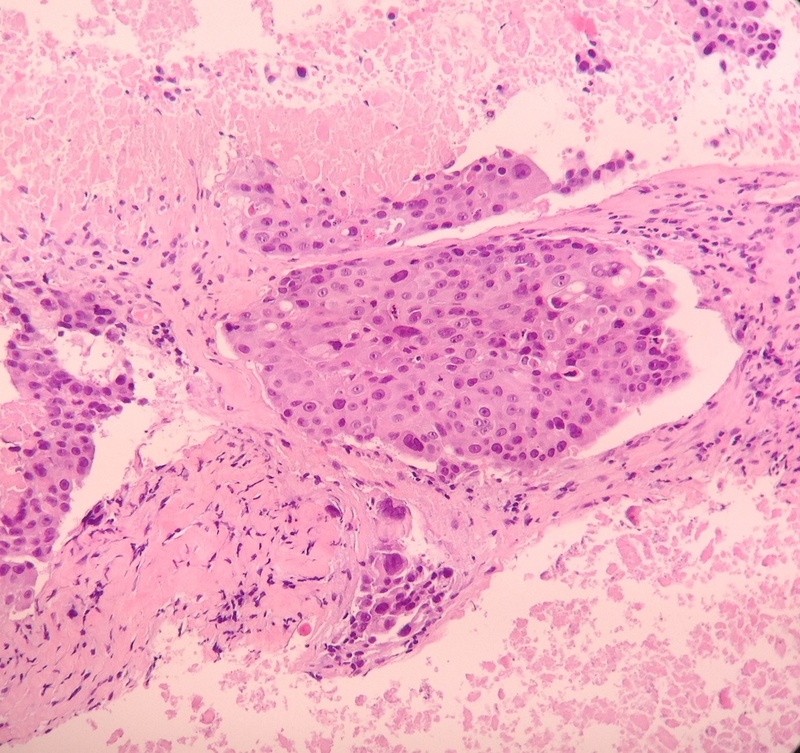 Gestational choriocarcinomas occur typically several months after a molar pregnancy (50%), abortion (25%), ectopic pregnancy (2.5%) or normal pregnancy (22.5%). The survival of gestational choriocarcinoma is approximately 90% after cytoreductive surgery and chemotherapy (Crum: Diagnostic Gynecologic and Obstetric Pathology, 1st ed, 2005). 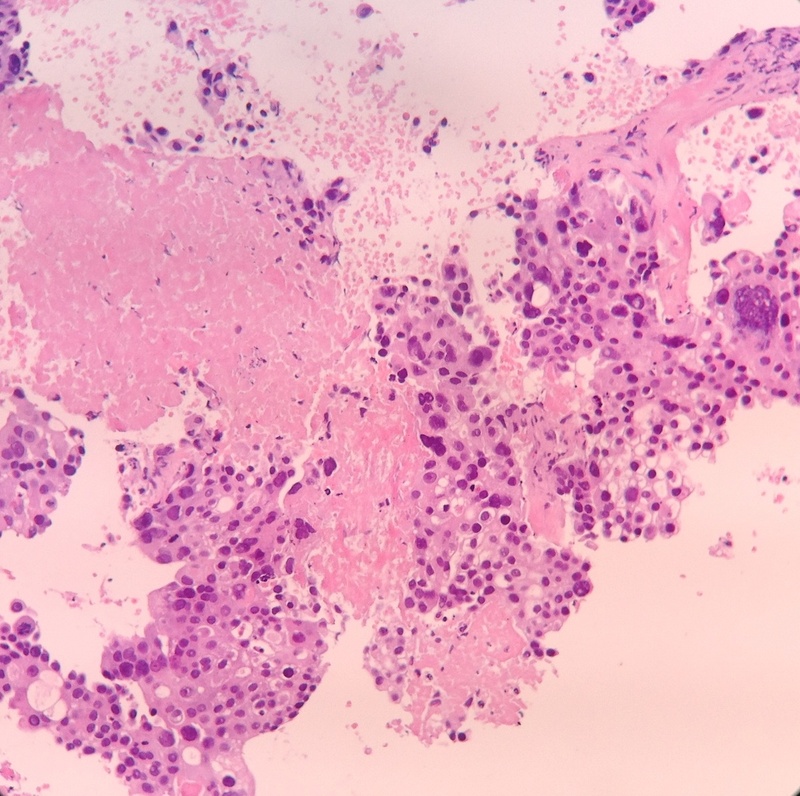 Women with a past history of choriocarcinoma may even be able to have a normal pregnancy after treatment (Wick: Silverberg's Principles and Practice of Surgical Pathology and Cytopathology, 5th ed, 2015). 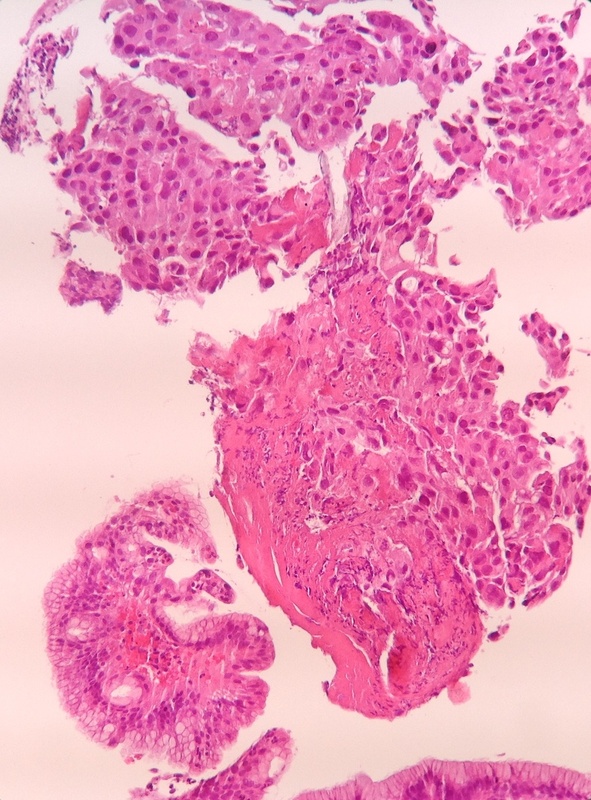 Primary gastric choriocarcinoma (PGC) is an example of a non-gestational choriocarcinoma, and has the same histologic features as its gestational counterpart. 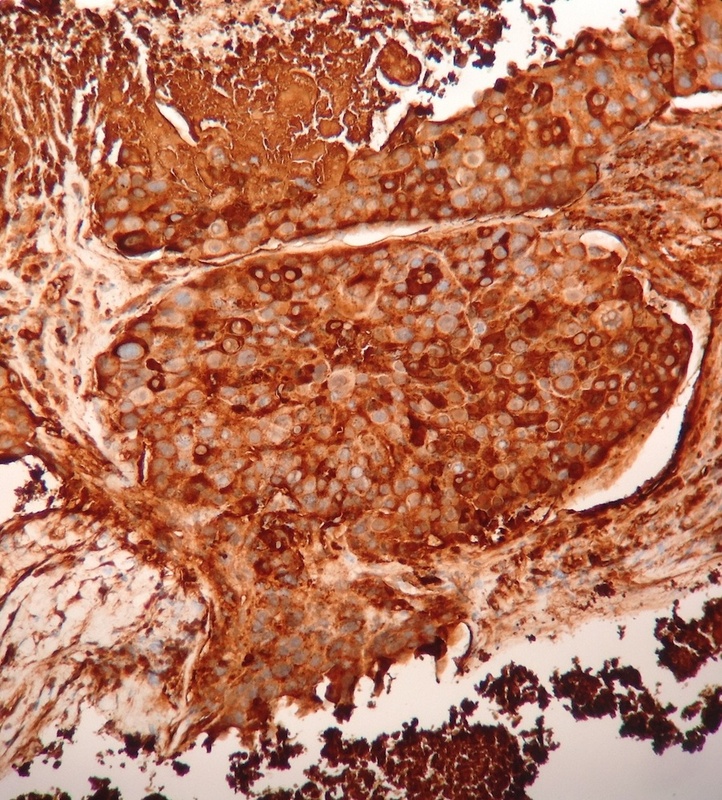 It is extremely rare, estimated to represent less than 0.1% of all gastric cancers. 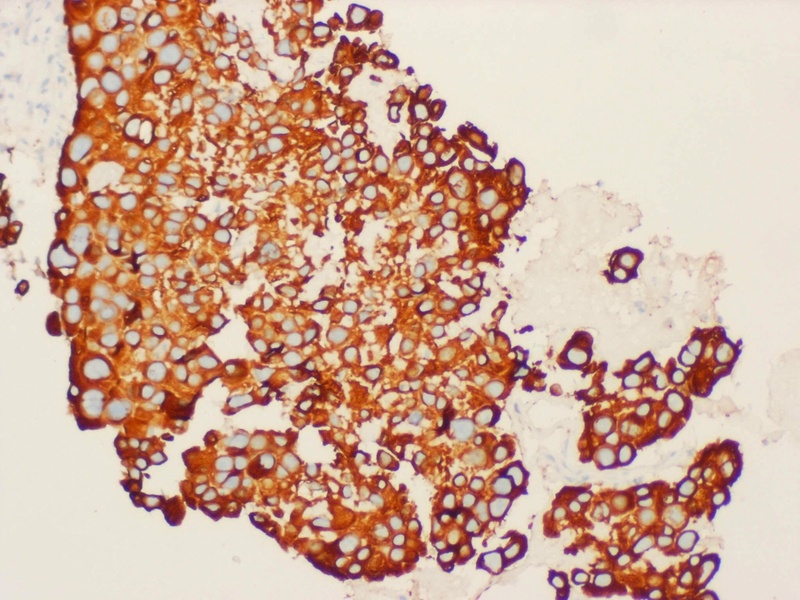 It can occur in either a pure form, or more commonly in association with an adenocarcinoma. Interestingly, several clinical features are similar between PGC and gastric adenocarcinoma, including mean age (seventh decade), gender distribution (M:F ~2:1), and tumor location within the stomach (lower third > middle third > upper third). 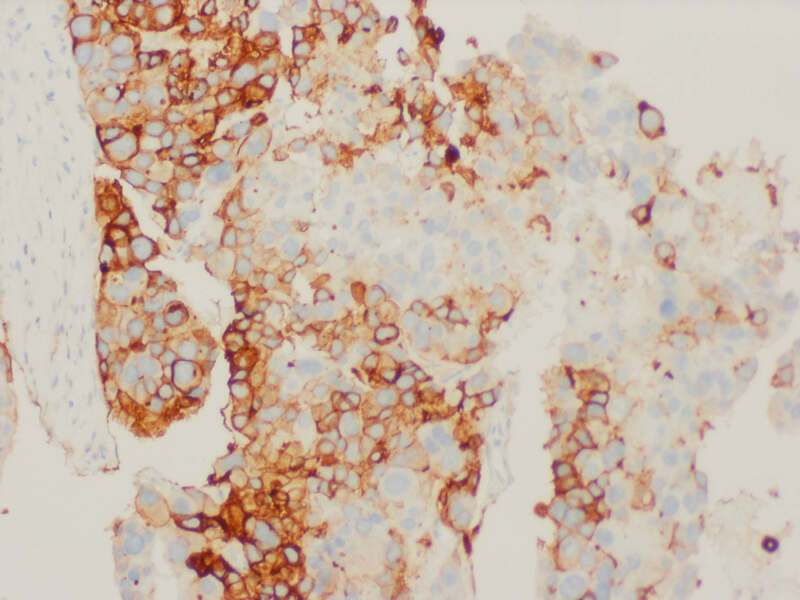 This suggests that PGC may represent dedifferentiation of a pre-existing adenocarcinoma (Gastric Cancer 2005;8:178). 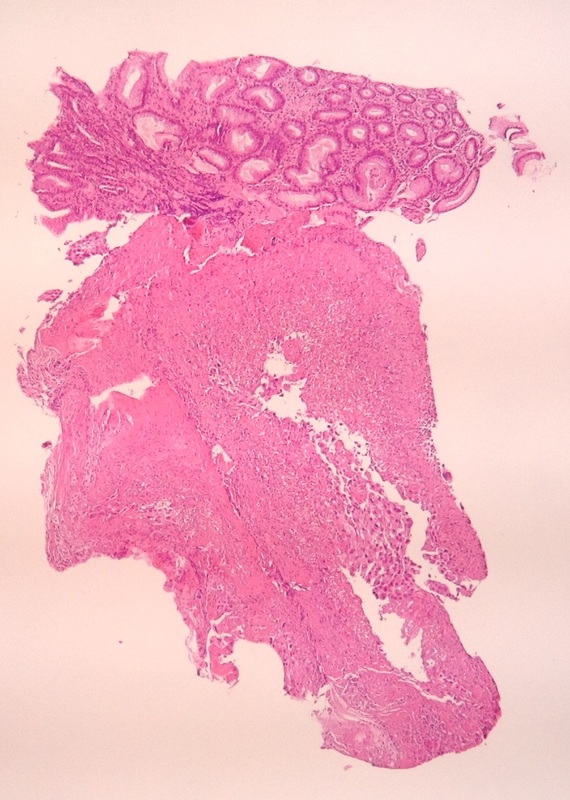 The clinical presentation of PGC is also similar to an adenocarcinoma: abdominal pain, loss of appetite, nausea, vomiting, weight loss, GI bleeding and anemia. However, PGC may also present with hormonal effects because of β-hCG production, such as gynecomastia, precocious puberty and "morning sickness" (Arch Pathol Lab Med 2001;125:1601). 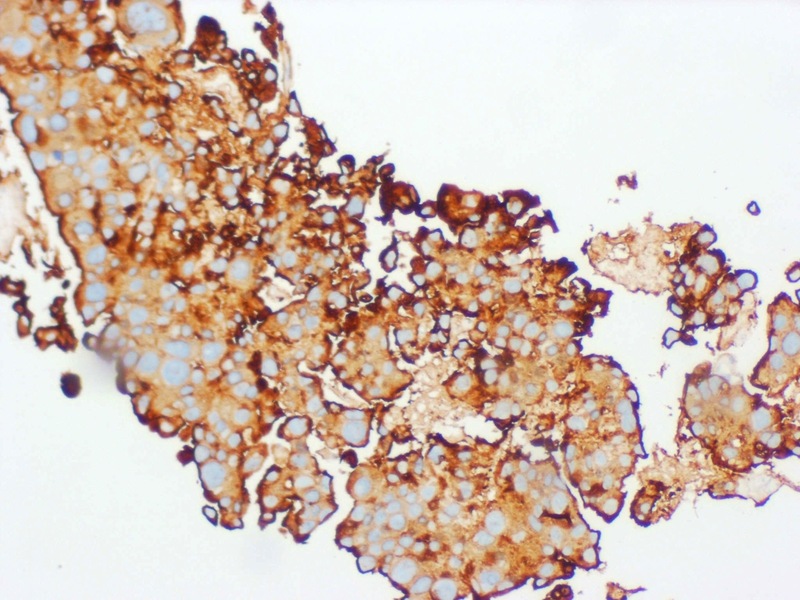 This patient's serum β-hCG levels were elevated at 5,686.1 mU/mL (normal: < 1.2 mU/mL). 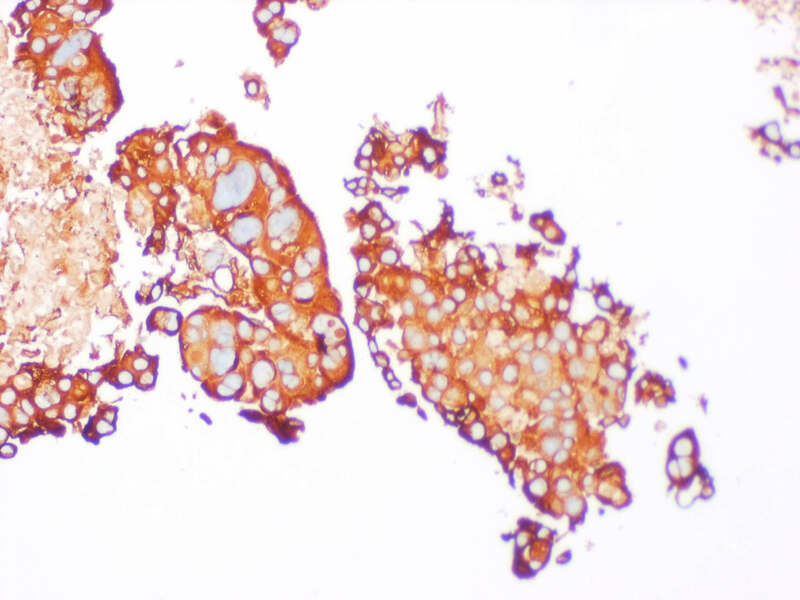 Immunostaining for PGC is the same as for gestational choriocarcinoma; in addition, as seen in this case, nuclear positivity for CDX2 and positivity for PLAP can be seen in choriocarcinoma (Tumour Biol 2012;33:2185, Acta Obstet Gynecol Scand 1996;75:753). 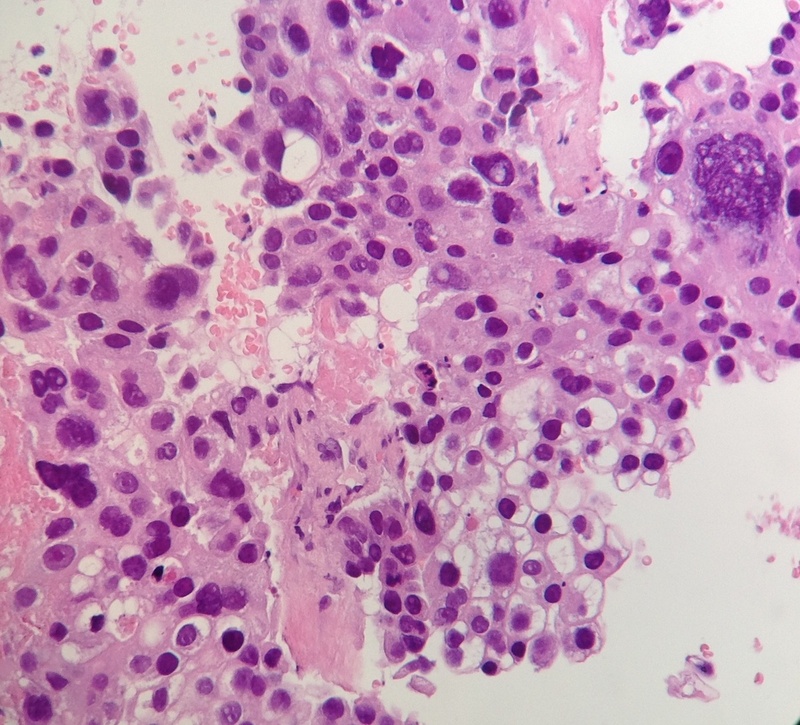 The prognosis of PGC is bleak, with most patients surviving only a few months after diagnosis. Treatment approaches involve surgical resection or chemotherapy, although there is no established regimen due to the rarity of the disease and the fact that it does not respond well to the chemotherapeutic agents used for gestational choriocarcinoma (Arch Pathol Lab Med 2001;125:1601, Crum: Diagnostic Gynecologic and Obstetric Pathology, 1st ed, 2005). Most patients have metastases at the time of presentation. 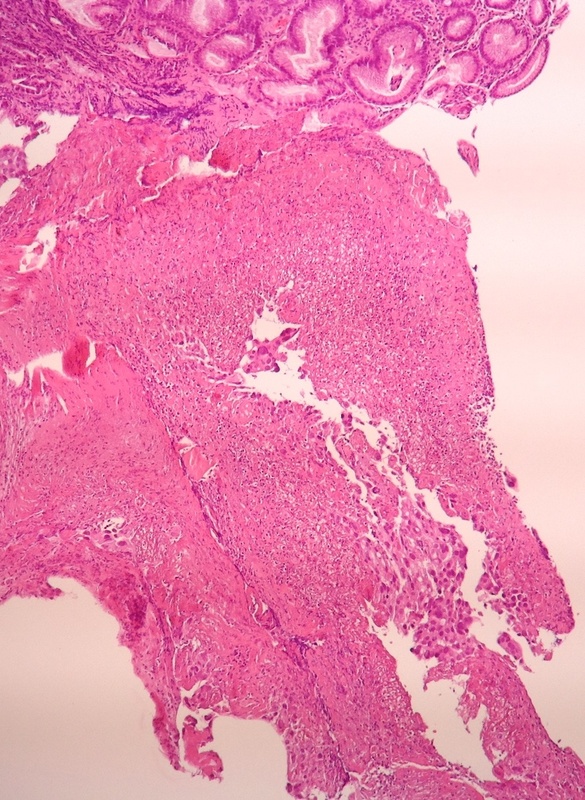 Metastasis to the liver may be an especially poor prognostic feature, as the most common cause of death from PGC is from liver failure or hemorrhage (Gastric Cancer 2005;8:178).